Background: Rhinoplasty patients present with a wide variety of nasal shapes to be changed. 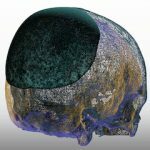 While the preoperative anatomy may be diverse, the end goals that most patients desire are much more uniform. What patients consider to be desired nose shapes have consistent features among them. Men desire straight dorsal lines and a tip that is not too thin or overly rotated. Conversely women may desire a dorsal line with a slight concavity/dip in it and a more narrow nasal tip that has more upward rotation to it. 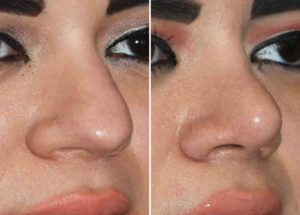 How achievable any patient’s desired nose shapes are is influenced by a variety of factors including nasal skin thickness. The thickness of the nasal skin is well known to be the greatest limitation to making a nose smaller or more defined. While such thick skin does not mean a reduction is not possible, it is just a limiting factor in how significant those reshaping changes can become. One feature of many Hispanic rhinoplasty patients is their thicker skin. With increased skin pigments often comes thicker skin. In female patients who desire a smaller and more refined nose, the importance of preoperative understanding of the limits of the nose shape changes that can be created is important. Taking a larger thicker-skinned nose to one that is petite and upturned is not a surgical outcome possibility. But positive improvements are still possible. 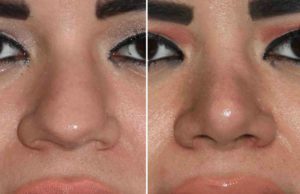 Case Study: This young Hispanic female presented for rhinoplasty. She had a long dorsal hump, a significantly deviated nose and a broad nasal tip. Her goals were predictable in terms of a petite upturned small nose….which was pointed out that such a drastic change is not possible. 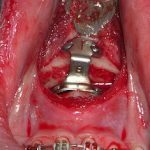 Under general anesthesia an open rhinoplasty was performed with cartilaginous dorsal hump reduction, left nasal bone osteotomy, septoplasty, tip rotation and narrowing with columellar strut and nostril narrowing with internal wedges. 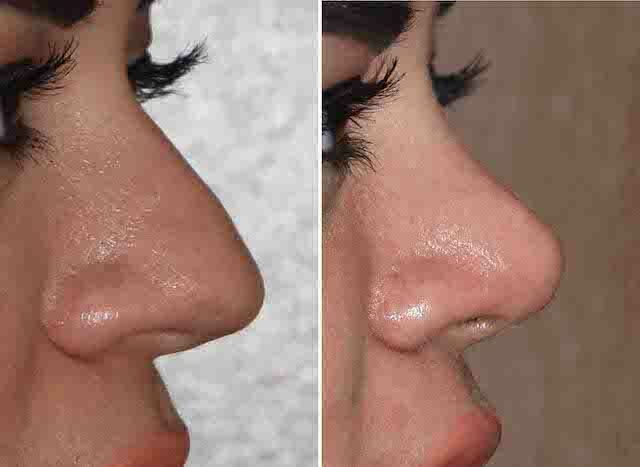 Her six week result shows good shape improvement, near invisible skin scars, and improved nasal symmetry. Some further reduction in tip swelling is expected over the next six months. 1) Hispanic noses come in a wide variety of shapes but most have a common theme of thick skin. 2) Making a smaller nose in a female with thick skin has its limits for reshaping/reduction. 3) The scars from open rhinoplasty and nostril narrowing in pigmented thicker skin can heal with near invisibility.